Sapi and Manukan Islands Tour, Day Tour In Malaysia. 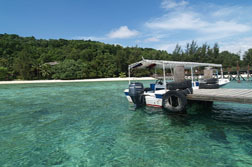 A boat ride less than half an hour takes you to Manukan Island just off Kota Kinabalu City. Manukan is ideal for swimming & snorkeling. The fine white sandy beach is perfect for catching some rays. You could take in all 5 islands (additional cost) of the Tunku Abdul Rahman Park & really bliss out on any 1 of the beaches, the blue sea and coral reefs with colourful marine life. Then move over to Sapi Island where lunch will be served. MORE free at leisure. Gaya, Sapi, Mamutik, Manukan & Sulug slands share tropical vegetation that supports all interesting wildlife. (To hop to other islands – you may request but there will be additional charges). 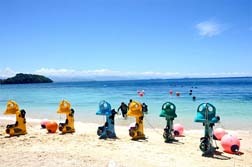 Sea Sport activities such as Parasailing, Jetskii, Kayak, Snorkel & Fin Set are available at own pax account. At 1530hrs, transfer back to mainland. Return to your hotel by 1530 hrs. Please bring Insect Repellent, Swim Wear, Sun Lotion, Hat, Drinking Water, Change Of Clothes, Sun Glasses & etc.